The selling volume of a particular product usually indicates just how much value it brings to customers. 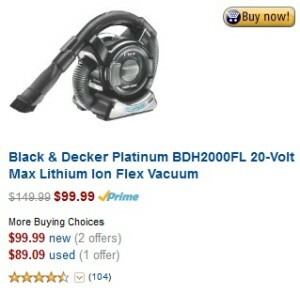 Over the past few weeks, we have analyzed Amazon.com’s Bestsellers in their household vacuum cleaners category (which gets updated every hour) and have narrowed it down to 10 handheld models that have consistently held their spot in the top 10. 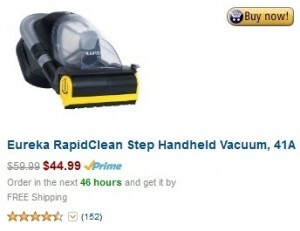 Here are the top 10 bestsellers in the category of handheld vacuum cleaners. 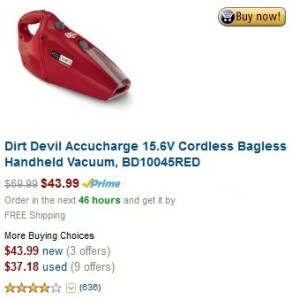 The AccuCharge by Dirt Devil is similar to their famous Scorpion model, in the respect that they both incorporate their trademark Quick-Flip crevice tool. However, in addition to that, this model is cordless and integrates AccuCharge technology which provides longer battery life, charges twice as fast and uses 70% less energy, thus saving you energy costs. . Using Smart Charge Technology, the AccuCharge only charges when necessary (when battery begins to deplete). It’s very lightweight weighing only 3.25lbs and includes an impressive 3 year warranty. Here’s a powerful, portable and cordless handheld vacuum cleaner that’s designed for cleaning pet hair. 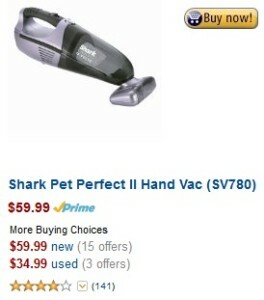 The Shark Pet Perfect II uses Twister Cyclonic technology to uphold strong suction power from its 18 volt battery. It just wouldn’t be effective at removing pet hair without its extra-large Motorized Pet Hair Brushroll which also doubles as a remover of ground-in dirt. Though the reach isn’t long, you also get a crevice tool and a dusting brush. 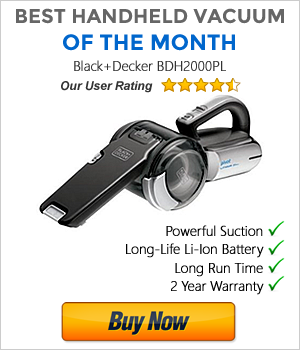 We consider the Black & Decker Platinum BDH2000FL to be one of the best handheld vacuum cleaners around, and feels it should at least be in the top 5 bestsellers. It has a proven high quality battery in the 20V Max Lithium Ion, which is able to hold a charge for up to 18 months and won’t suffer from memory loss, which prolongs its life. It’s able to maintain strong suction power through its Cyclonic Action Technology and by activating its neat little Filter Refresh Knob that flicks debris off the filter. You can also attach a crevice tool, a dusting brush and a pet hair removal tool, which all attach onto the flexible stretch hose. There are more handy features too which are worth taking a look at. You can read the Black & Decker Platinum Flex full review here. 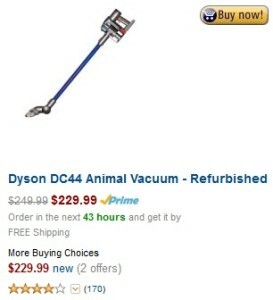 Dyson have somewhat of a love/hate relationship with consumers, as many believe they are too overpriced while others consider them to be the best. Nevertheless, they’re still extremely popular and the Dyson DC34 is their bestselling handheld model that doesn’t include a long-reach wand. It does however, utilize their patented Root Cyclone Technology for no loss of suction and incorporate a digital motor that operates three times faster than conventional motors. Dual Power Mode gives you two cleaning options intended for different purposes. You can also forget about buying replacements filters and bags because the DC34 uses neither. The Eureka RapidClean 41A is the successor of the EasyClean model, although both are arguably just as good as each other. The notable differences aside from the color is that the RapidClean has a very long reach using a 25 foot cord with a 3 foot hose and crevice tool. The main difference is the type of head it uses, which is a Motorized Brushroll that turns on to deep clean carpets and upholstery, and turns off to do its job on hard floors and surfaces. You can read the Eureka RapidClean 41A full review here. 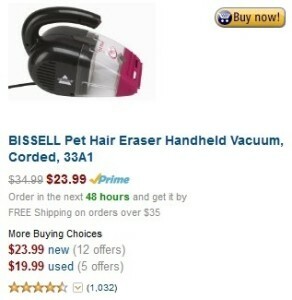 We believe the BISSELL Pet Hair Eraser 33A1 to be the best cheapest handheld vacuum for cleaning pet hair. It defines the meaning of “simple yet effective”. Its flexible rubber contour nozzle is the main weapon for targeting pet hair as well as removing tough dirt from carpets and upholstery, while the hard nozzle is for hard surfaces. A HEPA Media filter is also used to target and filter tiny pollutants and particles (tobacco smoke, pollen, dust mite feces etc.) that are harmful to those suffering from allergies or have breathing symptoms. 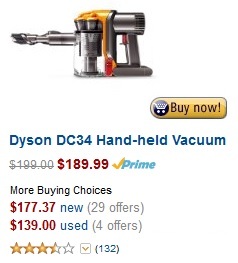 Ok, so it’s not brand new, but a refurbished model of the Dyson DC44 has still made it to the number 4 spot on Amazon’s bestsellers of handheld vacuum cleaners. It’s definitely the most technological and feature packed pet hand vac, and probably the best in terms of cleaning power too. You get the technological benefits of what every other Dyson vacuum has, which is Root Cyclone Technology and their own digital motor. But the DC44 Animal also has a special Motorized Floor tool that has two different types of brushes for hard surfaces and carpets/upholstery. Included is an aluminium wand that allows you to reach high and low without straining too much, and dual mode gives you 20 minutes of constant suction or 8 minutes of even higher suction in Boost Mode. You read the Dyson DC44 Animal full review here. 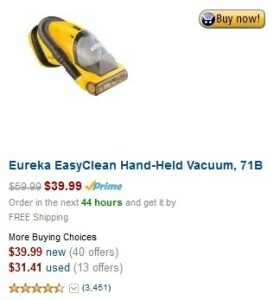 Not only is it in the top 3, but it’s also one of the highest reviewed vacuums on Amazon, the Eureka EasyClean 71B has proven to be extremely popular with consumers. This is due to the fact that it’s so effective at cleaning stairs thanks to its Riser Visor mechanism which stays down when cleaning horizontal surfaces but flips up allowing the motorized brushroll to clean vertical surfaces. It also has a separate motor dedicated to provide power for suction, and as a result , you get a pretty powerful device. You can read the Eureka EasyClean 71B full review here. The Black and Decker CHV1410L is the best value cordless DustBuster in our eyes, simply because of its integration of a Lithium Ion battery which improves performance by a large margin. The slim rotating nozzle and the extendable crevice tool at the tip gives you better access to confined areas. You’ll see better charge (up to 5x faster) and run times in comparison with other DustBusters that do not use a Li-Ion battery, and plus you save energy through it’s Smart Charge Technology that only allows the device to charge when necessary. 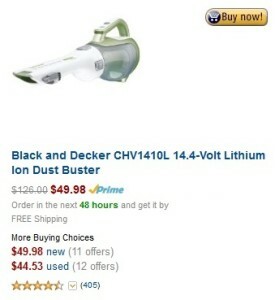 You can read the Black & Decker DustBuster CHV1410L full review here. 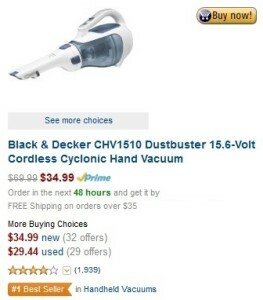 The number one bestseller is again from Black & Decker’s widely popular DustBuster range, with the CHV1510 and we suspect it’s because it’s the cheapest DustBuster that features a rotating slim nozzle. That doesn’t mean to say that’s it’s not good, actually far from it and its average user rating proves it. It still has strong consistent suction power by incorporating Cyclonic Action to spin dirt and debris away from the filter. However, it’s charging and running times plus lifespan of its battery cannot be compared with more premium DustBusters such as the one holding the no.2 spot. You can also see side-by-side comparisons of our 10 best handheld vacuum cleaners.